The Portomar Apartments features an outdoor swimming pool and childrenâ€™s pool for all the family to enjoy. The hotel also features a large sun terrace around the pool with parasol and sun loungers provided. Both the pool and the terrace overlook the sea and the approach into the Porto Colom harbour. 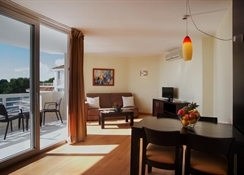 Each of the 80 rooms at the Portomar Apartments are fully air-conditioned and come with a terrace or balcony, kitchenette, lounge, in-room safe, and a private bathroom with shower or bath. Please note some amenities may be payable locally, and may need to be requested. 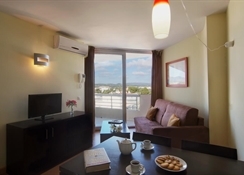 All of the apartments at the Portomar Apartments are self-catering apartments, but nearby are a good selection of cafes and restaurants to dine at. Majorca is the largest of the four Balearic Islands, situated off the East coast of Spain in the Western Mediterranean. The island boasts sandy beaches and views of the stunning azure sea. The island has a great infrastructure with great transport links, over 2,500 restaurants and a 41 Marinas. Majorca is the ideal location for a family or couples holiday. The island is filled with hiking trails and cyclist routes, making seeing the sights a fun-filled adventure.Porto Colom is a coastal development in the municipal district of Felantic, located to the south east of Majorca. The town has a reasonably sized supermarket and many restaurants and bars. The resort is very popular with British holidaymakers, many of which return to buy a second home. The area has popular karaoke bars and water parks to visit.